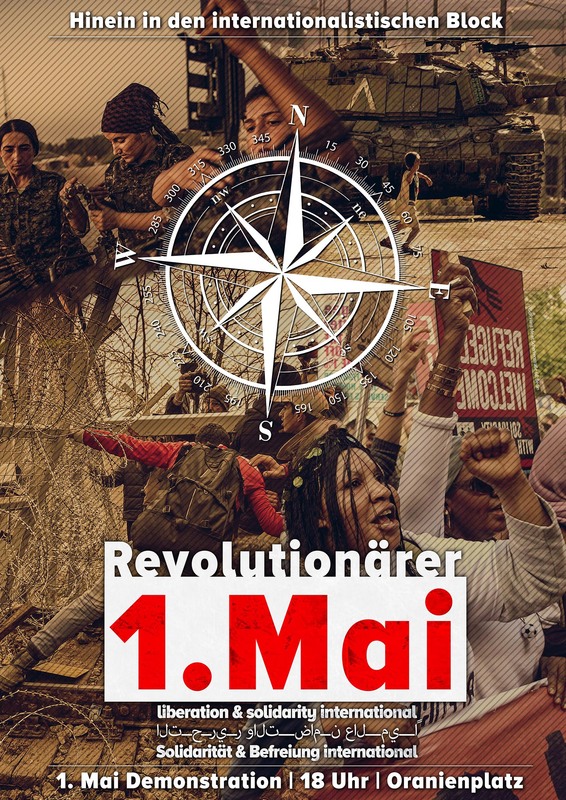 If you want to be part of an international movement for freedom and solidarity, join the internationalist block on the first of May! Reduced entrance for pupils, students, unemployed and pernsioner. Dinner and beverages will be offered. There will be running translation spanish-german & german-spanish. Finally! Our beautiful promo video has been produced and uploaded. We hope that it will give you an exciting preview on what expects you at our week of events from 17th – 22nd of october and our conference weekend on 23rd and 24th of october. We are happy to announce that our cultural program for the closing of our conference stands as well. 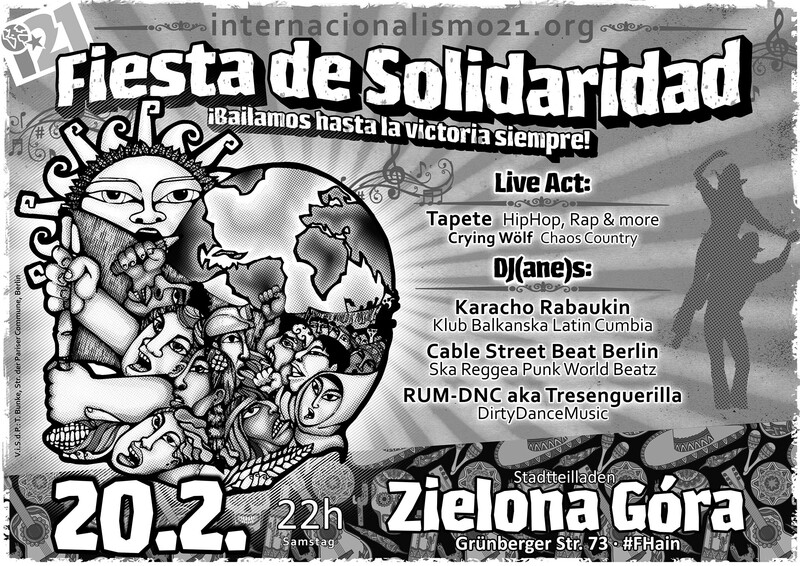 Together with Nicolás Miquea and Feieraben Poetic Cumbia, we would like to invite you to dance and sing with us. So, do not forget your dancing shoes! Your conference team “I21”. Nicólas Miquea is a politically active songwriter, poet and classic guitarrist from Chile. In Chile, he published in the literature magazine “Cabeza, manos, tronco y cuello”, he received a scholarship from the foundation “Pablo Neruda” and worked as a music teacher in the culture house “La Casa del Poeta” in Valparaiso. In 1999, Nicólas won the prize “Fondart” together with the group “Transciente” for the song “Los cinco minutos” which is dedicated to the famous Chilean musician Victor Jara. In Germany, Nicólas studied classic guitar at the School for Music and Theater in Rostock and the School for Music “Franz Liszt” in Weimar. He puts his musical prowess to good use as he supports a variety of political events such as the “Palestine Solidarity Festival” in Berlin. Apart from his own songs, Nicólas interprets several Latin American classics, for example Violeta Para, Silvio Rodríguez, Mercedes Sosa. 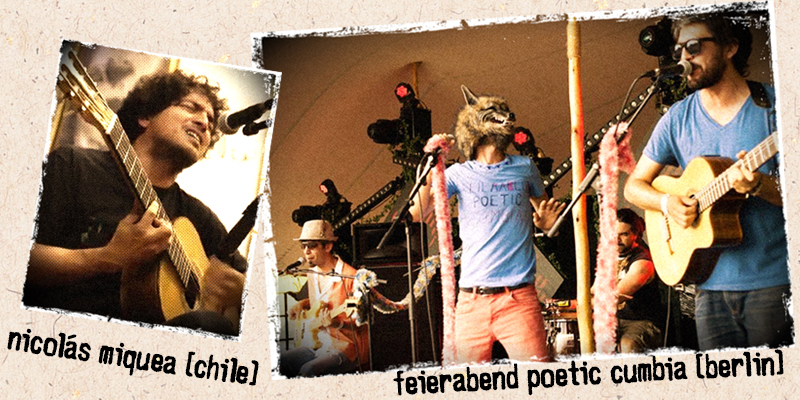 The band Feierabend Poetic Cumbia was formed in June 2013. 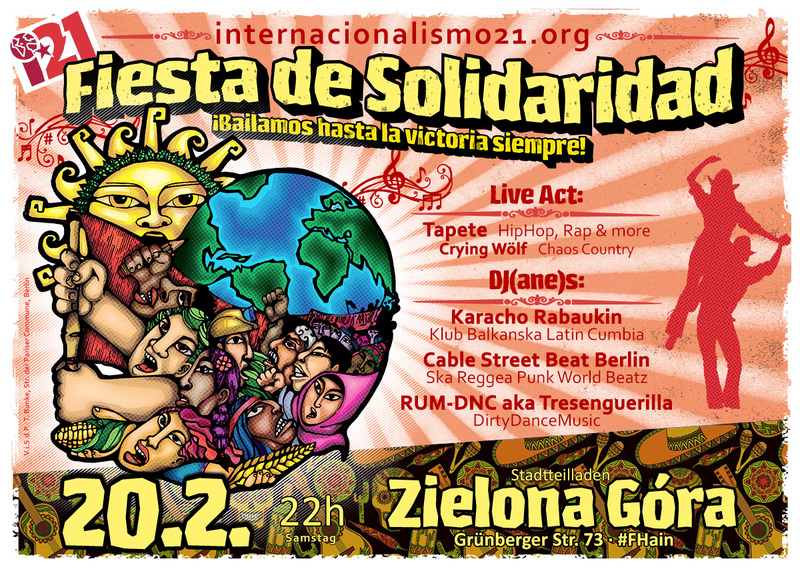 The members are from Chile and Argentina and are living in Berlin. In their songs, they unite their Latin American roots with influences from Berlin. They process their experiences as migrants and their rhythms vary between Pop, Ska, Cumbia, Tango, Cuarteto and Electro together with Spanish and German lyrics. We are especially happy to announce that the famous Colombian politician, lawyer and restless human rights activist Piedad Córdoba will speak at our conference on October 23rd. Piedad Córdoba is a staunch advocate of a negotiation cease-fire between the Colombian government and the FARC-guerillia, which the former Colombian president Álvaro Uribe has always been opposed to. In 1999 she was abducted by Carlos Castaño, leader of the now dissolved paramilitary association “Autodefensas Unidas de Colombia” (AUC). Her abduction lasted several months. Nevertheless, she was appointed by the government as an official mediator for a humanitarian exchange between the government and FARC in 2013. She achieved the release of several captives of the FARC. In addition to her activism for a sustainable peace, Córdoba is dedicated to bring about legal investigations of the massive violations against humanity during the military conflict and promotes the rights of the marginalized minorities and the poor. Unfortunately, the famous Swiss globalization critic, sociologist and internationalist Jean Ziegler had to withdraw his confirmation to speak at our conference as he will take part in a UN meeting at the end of october. Nevertheless, he wants to support our goal to enhance the internationalist cooperation between Europe and Latin America by agreeing to serve as patron of our conference. Ziegler showed his solidarity with progressive political actors in many respects. In his book „Gegen die Welt“ (Against the Order of the World), he analyzed the chances and perspectives of liberation movements in Latin America and Africa in a critical-constructive fashion. In the last 15 years, Ziegler stressed the importance of Latin American left-wing governments in the struggle against the catastrophic consequences of neoliberalism and the respective achievements in the struggle against hunger. We are happy to announce that Juan Manuel Sánchez Gordillo from Marinaleda/Andalusia has accepted our invitation to our conference. Sánchez Gordillio is a history teacher, union leader and politician. Since 1971 he is mayor of Marinaleda. From 1994 to 2000 and 2008 to 2014 he was a member of the Andalusian parliament for “Izquierda Unida” (United Left). Gordillio is mostly known as mayor of Marinaleda, a region in which speculation with real estate has been prohibited. In the English media he is known as the “Spanish Robin Hood”. we are happy to announce that we finally launched our official website. Here you will find our current program for the conference week and days. We completed nearly all the introduction texts about the speakers. In the course of the following weeks, there will be several changes and additions to the program. Furthermore, we will upload some material (texts, links, news, videos). In any case, taking a look at the website from time to time will be worth it. In case you have any questions, just write us. We are looking forward to it!